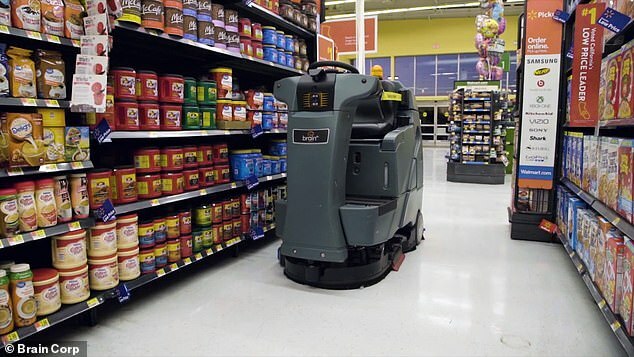 Walmart is set to unleash AI controlled floor scrubbing robots at its stores. The autonomous janitors can clean floors on their own, even when customers are around, the startup behind the smart bots said. The world’s largest retailer will roll out 360 autonomous floor-scrubbing robots in some of its stores in the U.S. by the end of the January, it said in a joint statement with San Diego-based Brain Corp., which makes the machines. The autonomous machines are equipped with sensors to scan for people and obstacles nearby. The floor scrubbers need a person to map an initial training route, but can then follow the route on their own. The robot uses multiple sensors to scan its surroundings for people and obstacles. ‘We are thrilled to partner with Walmart to enhance customer experience at its retail locations,’ says Dr. Eugene Izhikevich, CEO of Brain Corp.
‘BrainOS technology allows robots to effectively and safely function in complex, crowded environments, ensuring increased productivity and efficiency across applications. The robots already scrub floors at airports in Seattle, San Diego, Boston and Miami, Izhikevich said. 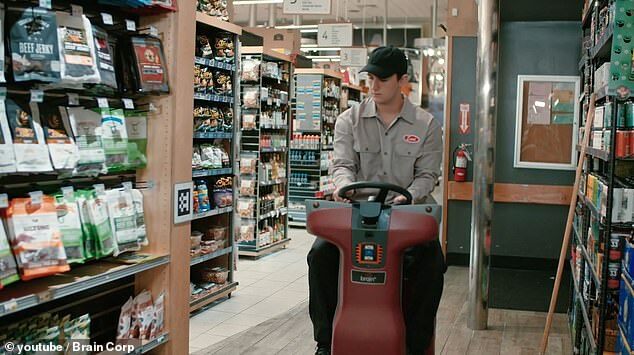 Brain Corp’s BrainOS platform already automates more than a hundred of Walmart’s fleet of commercial floor scrubbers across the United States. Walmart has also been experimenting with automating the scanning of shelves for out-of-stock items, and moving products from storage for online orders. ‘We’re excited to work with Brain Corp in supporting our retail operations and providing our associates with a safe and reliable technology,’ says John Crecelius, Walmart’s VP of Central Operations. Brain last month unveiled a smaller version of the machine developed jointly with SoftBank Group Corp.’s robotics arm and aimed at the Japanese market. ‘BrainOS is a powerful tool in helping our associates complete repetitive tasks so they can focus on other tasks within role and spend more time serving customers,’ John Crecelius, Walmart’s vice president of central operations, said in the statement.